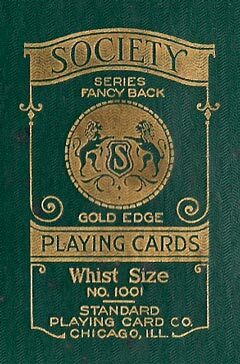 WoPC Home > U.S.A. > Standard Playing Card Co.
Standard Playing Card Co. started producing playing cards in c.1890 but was in business for only about four years before the newly founded United States Playing Card Company acquired it in 1894. 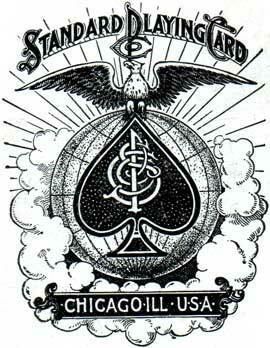 The Standard Playing Card Company continued operating as an independent company in Chicago, as shown on their Ace of Spades and packaging. 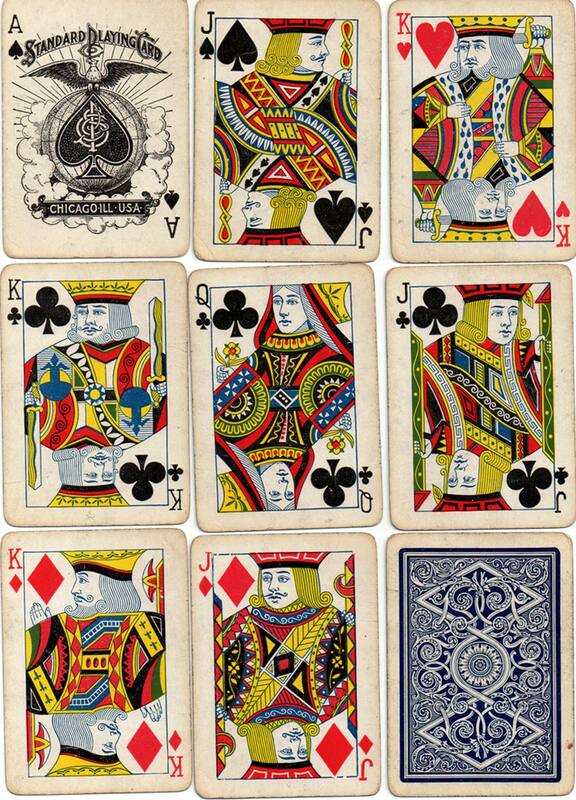 The Aces of Spades did not normally carry a brand name, but over the years the Standard P.C.Co produced a large number of brand names which were identified on the boxes and wrappers and in some cases on a special Joker. As the name suggests, cards were mainly standard in appearance, with some colourful jokers and a range of pictorial back designs by contemporary designers and artists in brands such as ‘Society #1000’, ‘Peerless #304’ & ‘Austen Beauties’. 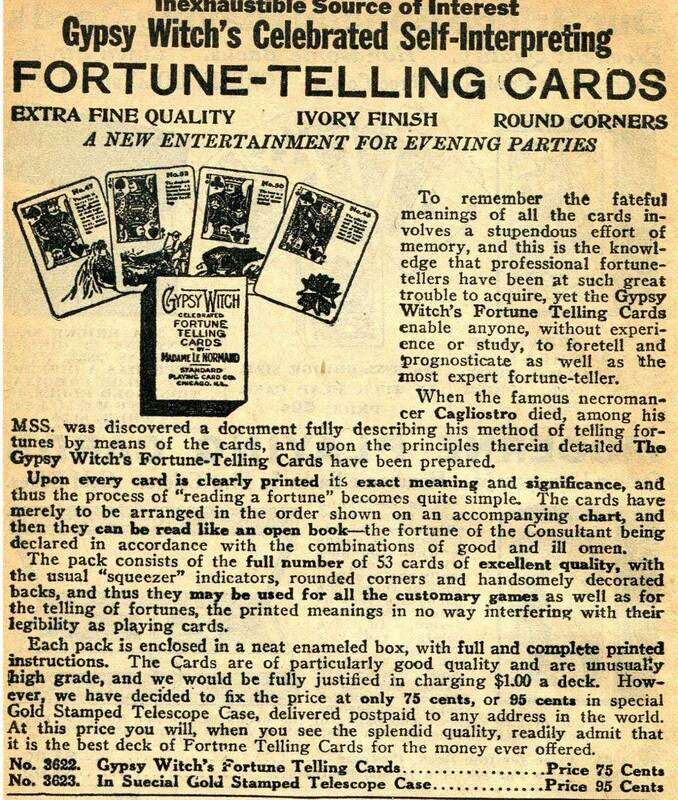 Standard P.C.Co was also known to have produced novelty concave decks, patience and souvenir decks some of which were credited to a different publisher. 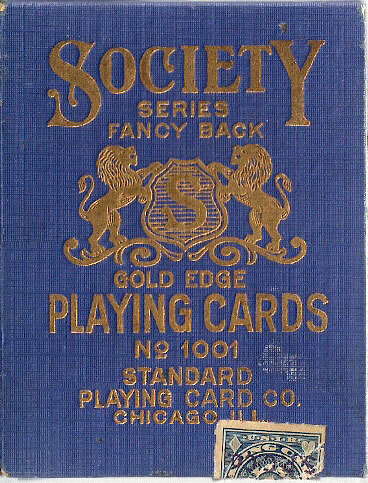 The Bay State Card Co. became a part of the Standard Playing Card Company of Chicago in the early 1890s. 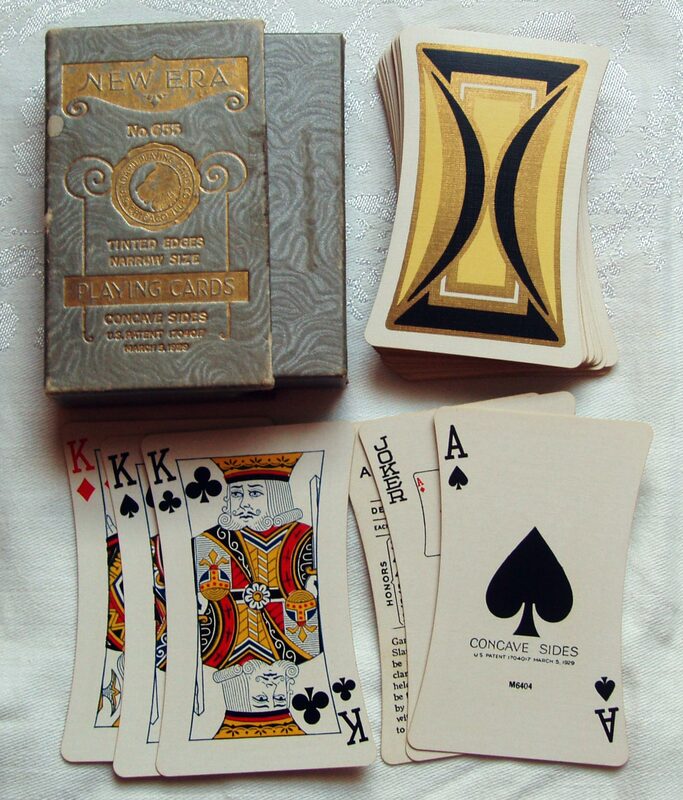 • See also: Peru Souvenir, c.1910 • New Era Concave Playing Cards. Above: Ace of Spades and court cards from two early Standard Playing Card Co. decks, c.1895-1900. The court designs in the lower set may have been acquired via Bay State Card Co. Images courtesy Ken Lodge. Above: a brand made for Parker Brothers, Salem, Mass. 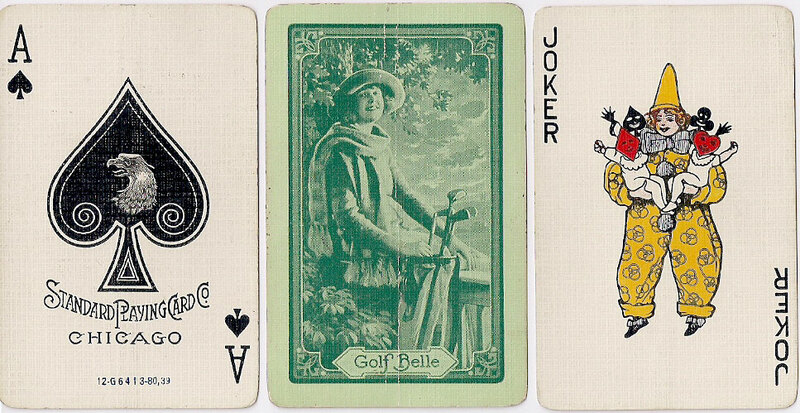 by the Standard Playing Card Co, c.1900 with scenic backs. Image courtesy Ken Lodge. 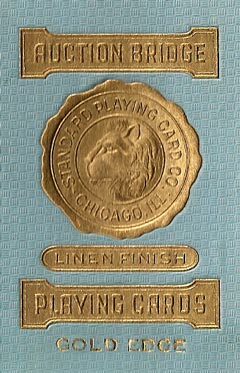 The Bay State Card Co. became a part of the Standard Playing Card Company of Chicago in the early 1890s and thereby part of the U.S.P.C.C. fold in 1894. 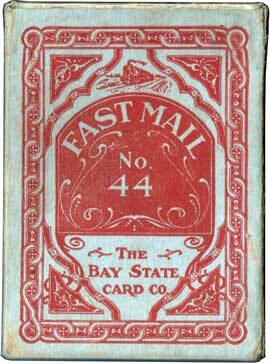 Above: cards from a pack of 'Fast Mail #44' playing cards with a Bay State Card Co. Ace of Spades. The box and back design both feature the steam train motif. The Bay State Card Co. became a part of the Standard Playing Card Company of Chicago in the early 1890s. The courts are like those of the American PCCo/Kalamazoo, but this version has the same courts (same plates) as a pack by the Consolidated Litho & Manufacturing Co of Montreal. Images courtesy Ken Lodge. Above: Gypsy Witch Madame Lenormand Fortune Telling Cards, copyright 1903 by Frederick J. Drake & Co. This deck has been published continuously ever since, this copy is from 1936. Each card has an inset picture of a playing card, a second image, and a text giving the meaning of the card. Some of the court figures have the wrong suit symbol: both the Jacks are the same, and the two Queens have the wrong suit signs. Images courtesy Ken Lodge. 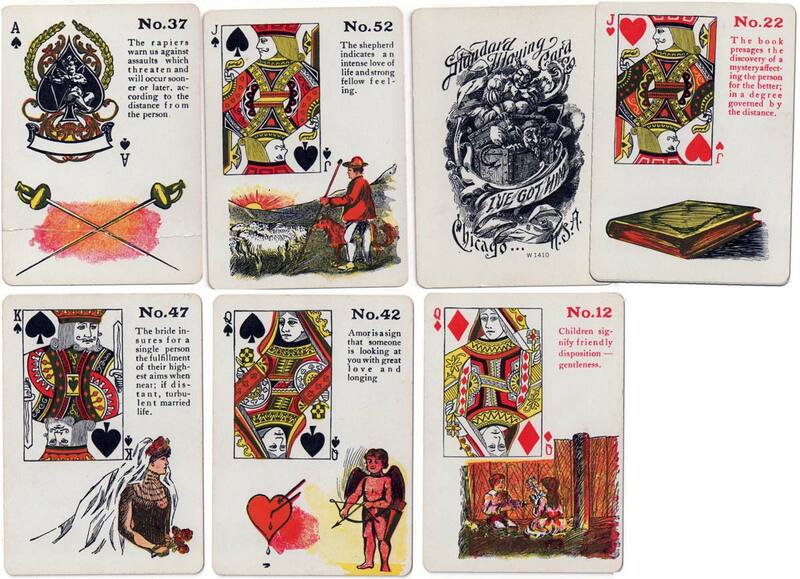 The Standard Playing Card Co also had its own courts similar to those of U.S.P.C.C. in two sizes, but shortly after their take-over Standard P. C. Co packs had standard U.S.P.C.C. courts. Above: 'Auction Bridge', c.1910. This Ace of Spades had recently been redrawn as their earlier one closely resembled that of the American Bank Note Co. A.B.N.Co advertising exhorted its customers not to buy the Standard P.C.Co's cheap imitation. Images courtesy Rod Starling. Above: Society #1000 playing cards with back titled 'Contentment', c.1918, with coloured version of the Ace of Spades. Images courtesy Rod Starling. Above: Society Series playing cards with back titled 'June Rose', c.1919, with coloured version of the Ace of Spades (click to zoom). This is a wide deck, is gold edged and the Joker is the same as was used by the American Bank Note Company, c.1906. 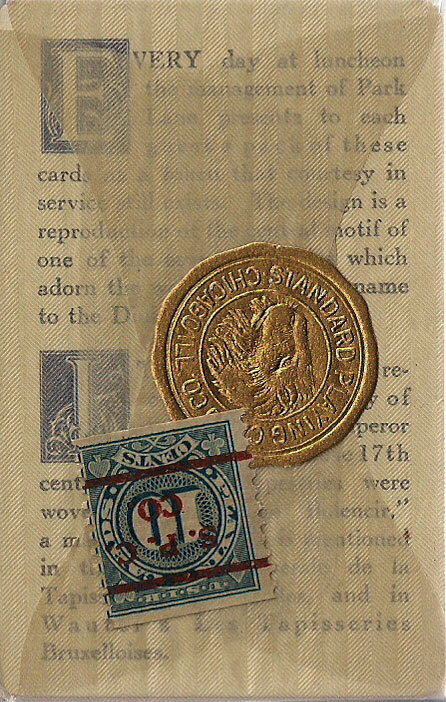 It has a tax stamp on the box that is cancelled “1920”. Images courtesy Rod Starling. 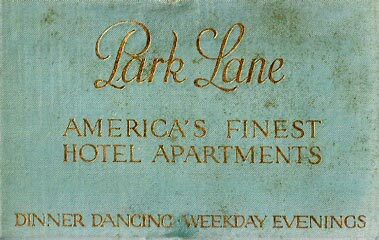 This “Park Lane” deck was made by Standard Playing Card Company, Chicago, c.1925, as a souvenir/advertising deck for the Park Lane Apartments which was actually an apartment hotel located at 299 Park Avenue, one of the most expensive parts of Manhattan. It was a very posh establishment that catered to a clientèle that appreciated the finer niceties of life and could afford them. Decks were presented in individual boxes housed in an outer double box. Unfortunately, it is now not only closed but the original building was demolished and replaced by a 47 story office building that opened in 1967. Above: the back design is a detail from a tapestry that hung in the Tapestry Room Dining Room. The information card, barely visible, reads as follows: "Every day at luncheon the management of Park Lane presents to each guest a pack of these cards as a token that courtesy of service still exists." The deck is gold edged and was one of Standard's best productions. Images courtesy Rod Starling. Above: “Neptuna” made by the Standard Playing Card Company, 1925. Above: “Snow Girl” made by the Standard Playing Card Company, 1926. Above: a revival of the old Standard/Bay State courts in a pack advertising ''Eli Cutter' cigarettes published by USPCC, 1985. The court have the inscription "Copyright 1895 Hiram Jones" down the sides. Images courtesy Ken Lodge. All images on this page are from the collections of Ken Lodge and Rod Starling.